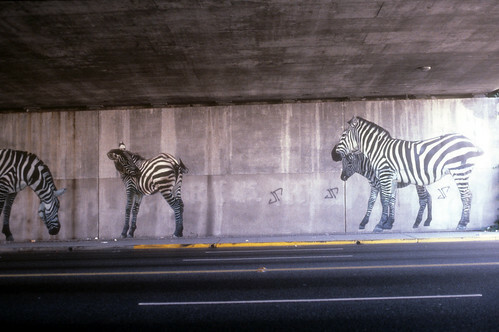 These are giant murals of zebras grazing along the north side wall on the 580 Highway underpass on Broadway. There are also giraffes on 580 at Harrison Street. The murals were sponsored by the Oakland Office of Community Development. Oakland North Profile on Dan Fontes includes additional images. Considering these were put up in 1985, they've held up very nicely. Well done Oakland!